Looking upstream on Codorus Creek just below the Brown Road access. 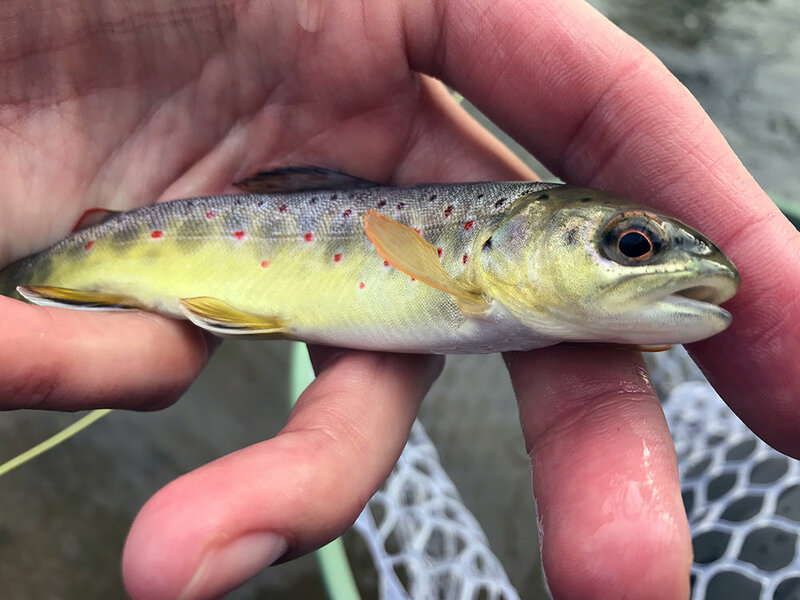 I did quite a bit of research on the Codorus Creek leading up to the weekend and as is typical with wild trout streams, there was very little info online. By reading some old blog entries, news articles, and forum postings, I was able to get a handle on a couple of places to park. A majority of the easy to find parking lies off of Krafts Mill Road, above and below the Stewart Laughman Sawmill. There is a small parking area in a field off of Brown Road, areas along Porter Road next to the railroad tracks, and at the bridge off of Thoman Drive. I arrived at the Brown Road access around 11:00am on Saturday. This time of year I like to wait until mid to late morning to begin fishing because it gives the water time to warm up which typically translates into the fish being more active. 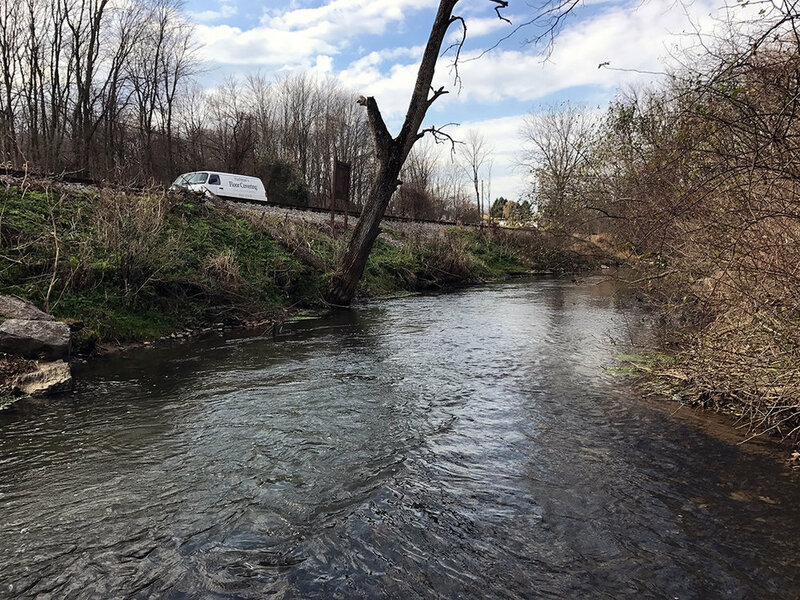 The Codorus Creek is not a wide creek, averaging between 8-10 feet for a majority of its path through the York County countryside. However, the water depth is more diverse. There are areas where the water is only a few inches deep and areas where it is 3-4 feet deep in large cool pools. There is no doubt that the Codorus Creek is the perfect environment for wild trout to grow to lengths of 20” or more. The creek maintains a riffle and pool layout with occasional long stretches of flat water. The parking area along the railroad tracks on Porters Road. I brought my 9’-5wt Scott G2 and Abel set-up and quickly realized that although a 9-foot rod can be used on the Codorus, it makes it more challenging than it needs to be. I’d recommend a 7’-3wt if you have one in your arsenal. I tied on a 9’-5X leader and ran 5-1/2X tippet to my flies. My flies consisted of a dropper rig with a #14 green scud pattern with a #18 Frenchy nymph tied off the hook bend. Before I started fishing, I walked several hundred yards downstream so that I could fish upstream to the wild fish. I decided to drift my nymph rig below a small indicator with no weight. After fishing about 25 yards of creek I finally hooked up with my first Codorus Creek wild brown trout. What a beautiful fish. My first wild brown trout on the Codorus Creek. I spent a couple of hours working my way upstream back to my truck. I hooked and landed several small wild brown trout during this time. I fished all the water I came across, even the flat pools, hoping for the tug of a wild giant. 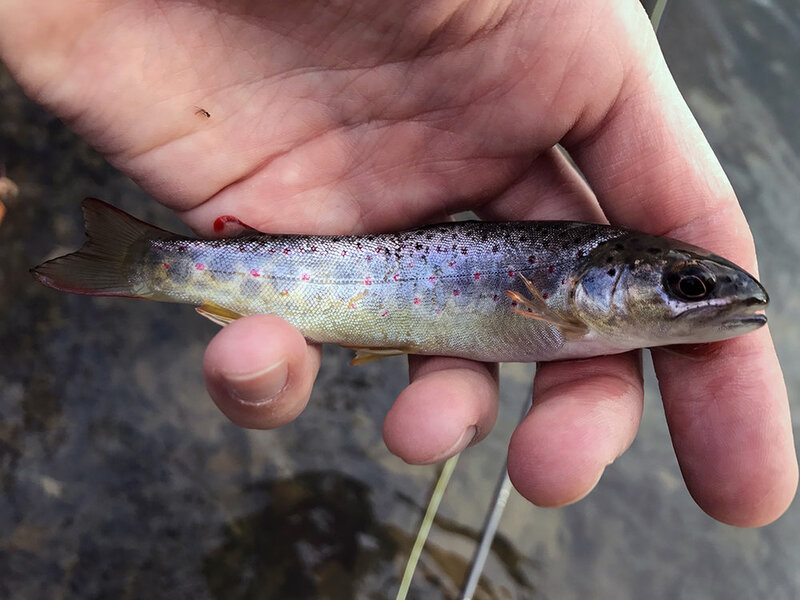 At one point I did hook up with what appeared to be a 15” or better wild brown trout that went acrobatic with my nymph and threw the hook in the process. I would’ve loved to have landed that fish. One thing you’ll find fishing the Codorus Creek is that there are sections that don’t get fished much because the edges of the stream are covered with underwater vegetation that is growing out of soft mud that is waiting to inhale your wading boots. You truly do have to be careful. I had several instances where I sunk in uncomfortably far and had a hard time getting my leg out. Again, some of this water probably holds some great fish as I found when I made a cast upstream into one of these areas and was briefly hooked up with a very healthy brown trout. There is a lot of mystery that surrounds the Codorus Creek and I’m sure that’s what keeps guys coming back. While I was fishing, I ran into a spin fishermen who told tales of large brown trout he’d caught when he least expected it. I believed him. After working the water that lies between Thoman Drive and Brown Road, I decided to head upstream and fish the water above the mill. There is water in this area that is very deep and virtually impossible to cross without getting wet—even in chest waders. It is also difficult to tell where you can legally walk without trespassing. Much of the stream passed through private farmland and the landowners graciously allow fishermen to access the stream. I can tell you that I laid eyes on water upstream at a distance that I want to come back and throw large streamers into. I’d specifically like to explore the water that lies between the Stewart Laughman Sawmill and the base of the Lake Marburg dam. It will have to wait for another trip. The markings on stream bred brown trout are beautiful. I probably caught ten wild trout during my afternoon exploration. All the fish I landed were in the 6-8” range and most fell to the scud pattern. The Codorus is filled with freshwater shrimp. I did fish other natural patterns like Hare’s Ear and Pheasant Tail nymphs without success. Perhaps these patterns would work better in the springtime when the mayfly nymphs are active. The water temperatures reached 52 degrees on Saturday and I did witness a handful of rises during my time fishing. Something about the Codorus Creek got into my blood and I want to go back. Perhaps some day I’ll tell a tale of a large brown trout I briefly held in a net and then released.